The New Dark Age crew visited Memento Mori, the dance club and socializing event held monthly on Thursdays at Bedlam Bar in Manhattan’s Alphabet City. Greeting us was hospitality hostess, Ana Vice, deejay and queen bee of the dark social scene and one of the originators of this club event. Equally hospitable DJ Bela Lugosi Alex approached us and was eager to hear about and view photos from our recent adventures at music festivals in Eastern Europe. Up in the deejay booth were Mike Stalagmike, noted impresario of Defcon, and caliginous presence, Valefar Malefic arrayed like a vampirish maestro of deathrock. The bar area has spectacular décor which includes taxidermy elements, game-trophy heads mounted high on the wall, specimens of god-knows-what in jars, anatomical models and charts, plus a well-stocked bar and an efficient bartender. The dance floor is grotesquely festooned with a dense array of tattered fabrics hung from the ceiling. There’s also a dimly lit lounge in back. The cast of attendees tends to represent the select population of beautiful creatures from the City’s urban underground. Other notables of the scene included Mark Cage Knight, who held court with his companions in the comfortable lounge in the back room behind the dance floor. Comfortably ensconced in booths in the bar area were Joe Hart, similarly surrounded by beautiful creatures of the night; scene regulars, Jennifer Bobbe, keyboardist for Night Gallery and Alain Leriche accompanied by the statuesque Nicole Eres. Emanating from the sound system were such delightful rarities as “A Little Death to Laugh” by Cold Cave and “Lion King” by Ghosting. This is music you won’t hear at the average goth-industrial dance club. Getting out on a Thursday night, which is the only night of the week on which Memento Mori is held, is well worth it to those who wish to delve deeper into the New York demimonde and its dark music scene. The “Depeche Mode Edition” of Ward 6 was held at Windfall Saturday night, July 29, and treated as an after party to the Depeche Mode cruise along the Hudson River, which ended at around midnight the same night. Reduced admission was granted to those bearing tickets from the cruise. DJs Jeff Ward and Patrick Cusack took turns at the deejay booth, spinning post-punk with a heavy reliance and frequent returns to the Depeche Mode repertoire. After being greeted by host Chris Savo, we hit the dance floor to the sound of The Cure’s “Fascination Street.” Wolfsheim, the Eurythmics and men Cabaret Voltaire were part of the mix. Shortly before 1 a.m., “The Fly in the Windscreen” by Depeche Mode hit the air and what followed was basically an alternating set with Depeche Mode songs between such other appropriate favorites as Kate Bush, et al. DJ Ash made an appearance following his assigned duties on the cruise. Other notables of the scene were William Welles, DJ Arsenal and Joe Hart, the latter two accompanied by their lovely better halves. Castle Party—a festival of dark, independent music—has been held annually for the past 20 years in the well preserved ruins of Bolkow Castle in the Silesian region of Poland. The gothic structure, which sits on a 1,200-foot precipice, dates back to 1277 and is still largely intact, boasting an impressive tower and monumental walls. The adjacent courtyard, where a great outdoor stage is erected for concerts, is 7,600 square meters in size, a shade smaller than an American football field. Access to the castle is easily obtained via a steep street, that then turns up a cobblestone-paved footpath and staircase. Vendors of steampunk, vampiric and related attire and accessories line the town’s road leading up to the castle. A couple of young men in monk’s cassocks man an oven, baking a Polish version of pizza on rye bread. Beer stands and ice vendors are present along the way. Once you have climbed to the entrance, your wristband for entry (270 Polish zloty: around $75 USD for all four days) is double-checked and you pass through the arched portal onto the castle grounds. Beer stands are everywhere. Purchase is by way of converting cash into zetony, a medium of exchange similar to poker chips. There you find rows of food stands and vendors within the walls of the castle and an abundance of exceptionally cleanly portable toilets. You can climb a stone staircase up to a higher level to view the field, the stage and an incredible panoramic vista from this spectacular height. Or you can step out into the field and find a comfortable location to stand or sit for the shows that begin around 4 p.m. each afternoon. The town of Bolkow and its 5,300 residents turn out with an abundance of hospitality to welcome the 4,000-plus, predominantly black-attired Goths, punks and industrial freaks who attend annually. An abandoned Evangelical church inside the town serves as a second, indoor venue where each afternoon/evening is dedicated to a specific style of music, featuring series of bands who each perform 40-minute sets within the theme of the day. Thus, opening night, Thursday, July 13, church program was “gothic” bands. Friday, July 14, was “Metal” day. Saturday, “industrial,” and Sunday, “electro.” The church grounds are cluttered with beer and food trucks, picnic table and socializing music aficionados. Again, there are more than sufficient numbers of clean, sanitary portables, so that the queue to them is mercifully short at all times. Starting very late each night and into the following morning, the local bar and dance venue, the Hacienda, features four deejays, each with their own signature style and reputation, spinning two-hour sets from post-punk to Italo, goth, deathrock and coldwave. The entire town—especially the walkways leading up to the Castle—and the grounds surrounding the Former Evangelical Church—provide a pageant for the eyes as participants promenade in beautiful as well as bizarre outfits, makeup and costumes as they traipse between venues or stop to eat, drink and socialize. Cosmetic extremes, headdresses, wings, wigs, tattoos and apparel are on display, blending fashions that represent gothic, steampunk, sci-fi and horror as well as punk, heavy metal and New Romantic styles. Arriving early in a rented car from the nearby major city Wroclaw (believe it or not, pronounced “Fro-swav”) on July 13, we settled into accommodations at a nearby antiquated “palace” or mansion that was a short 10-minute commute to the town of Bolkow. Street parking within Bolkow was certainly safe and generally fairly easy to find. Once decked out in our everyday all-black attire, we headed to the former evangelical church where the party was opening with the Goth Night selection of bands. The first band we caught was Lahka Muza, a Slovakian quartet consisting of three women with big hair, high makeup and fetishy, steampunk attire plus a male guitarist. Together they had a big, thunderous sound produced by richly stratified electronics. The songs were generally slow paced, layered and noisy, and featured a mournful female vocalist who spiced it up with operatic yodeling. Another played bass and the third, sexily clad, just gyrated robotically in place. The sound that was issued was something like Kate Bush-from-hell. Or soundtrack for a horror movie. Next up was Dividing Lines from Leipzig, an amplified female-led melodious yet intense punk quintet who served up as good a punk sound as anything you’ll hear in the 21st century. Next was Star Industry, a really excellent old school goth-dance quintet whose original, galloping, minor key melodies were reminiscent of the Sisters of Mercy. To confirm that observation, they performed one respectable cover of the Sisters in their set as well as a cover of MGMT’s “Kids,” along with 45 minutes of their own original stuff. Sweet Ermengarde from Germany with a Polish percussionist co-founder followed with their dense, dark, echoic and guitar-based sound, rooted in ’80s British goth, but updated electronically. “Gonzo” Vuline of Love Like Blood made a guest appearance to perform a duet as he has done in past performances with Ermengarde’s vocalist Dan. Live performances the first night at the church closed with USA’s Frank the Baptist who opened with a brief monologue to the effect of “Welcome to church,” by which we understood him to mean some kind of jocular reference to the venue as well as his own snarky moniker. Although there were some eerie elements, by and large, the prominent vocals, the bass and the relentless beat took us back to the earliest days of hard rock. In fact, our suspicions that Frank the Baptist was reviving the Rolling Stones were confirmed when he and his band covered the Stones’ “Paint It Black.” Worthy music, but hardly gothic, unless one allows for the possibility that dark elements in the Rolling Stones’ oeuvre were setting the stage for the later emergence of what was to become goth rock. At the close of the set, deejays took over the church and we returned for the night back to the mansion where we were staying. The castle had not opened yet. Friday was “Metal” night at the church. Death metal, black metal and mythological occult metal were represented. In Twilight’s Embrace, Shodan, Ulcer and Beheaded each brought their version of death metal to the stage. The last of these, Beheaded, from Malta, gave what was described as a powerful and convincing performance by one astute metal head whom I consulted. Their long-haired and charismatic vocalist Frank Calleja growled ferociously and with utter sincerity for several songs from this year’s newest release. The drummer mimicked the cadence of repeated machinegun bursts. Band members swung their long tresses like windmills. The band’s name appeared in classic metal font on the backdrop of the stage as the crowd—at first sparse—came to fill the hall. Half a dozen acts had already gone on and off stage by the time we showed up at the big outdoor stage of the castle to see Diorama, a German electro-gothic trio, whose unfortunate dependence on technology fatally sabotaged their act. Nobody sounded better than Diorama with their guitar-driven, melodious set, but then some kind of audio incompatibility cut short their set, which had started off tantalizingly good with a hypnotic rhythm and dark, gothic melody, but collapsed electronically. The band and tech support struggled mightily for nearly half an hour, but when the problem was solved and when they came back on stage, their performance was positively masterful, characterized by delicious melodies, rich, melancholy vocals and mesmerizing rhythms. I would liken them favorably to Covenant with a harder edge. The night’s program was more than redeemed by the next group up: Arkona, a Russian folk-metal quintet with a gorgeous female lead vocalist, clad in leather pants, peasant boots and a blouse redundant with long fringes, who could go from singing to yodeling to roaring like a bear, at times sounding like a man twice her size, electric guitarists, bagpipes and flute. At one amazing point this vocalist sang, full-throated with the delivery of a Russian operatic contralto, a cappella accompanied only to the beat of a native drum. The term speed metal comes to mind, blended—then alternated, seamlessly—with Eurasian traditional folk. The sheer power and pathos of Arkona’s performance captured the hidden sorrow and the defiance of the Russians whose music reflects their suffering and survival against the forces of authoritarianism and nature’s elements over the centuries. A semi-punk, semi-folk-dance mosh pit churned energetically throughout their performance. Topping the night off was German electronic darkwave quartet, Diary of Dreams, whose captivating minor key melodies, angry, morbid lyrics, sung mainly in English were accompanied by a heavy, ominous, musical tsunami including a synthetic chorus. Such is the state of modern music that much of the time, the Instrumentalists seemed to hardly touch their instruments and yet a wall of complex and layered music continued pouring from the speakers. They reminded me of a delightful but more morose, more desperate version of Wolfsheim. Saturday at the church was “Industrial” night, and I won’t soon forgive myself for missing the eerie audio-visual works of Czech musician Vladimir Hirsch, of America’s Schloss Tegal and of Rapoon from the U.K. These artists stretched the boundaries of how we define music with non-rhythmic soundscapes of industrial and ambient noise, unconventional and sometimes incomprehensible note sequences issued by synthetic versions of musical instruments, choral chants and indescribable sources. Although none of this fits the definition of what most mean when they say “industrial” of industrial, these sets served to enlighten and broaden the musical taste of those with a willing and open mind. But I was astounded and pleased to have arrived in time to witness the intense freakfolk violin plucking and strumming of Sieben from Sweden and the stunning musicianship of neo-folk artist Rome from Luxembourg. This singer-songwriter soloist accompanied himself on guitar, and was joined later in the performance by a couple of other musicians. With his magnificent, Leonard Cohen-esque baritone voice, intense, confident delivery and brilliant arrangements he stood out as perhaps the most talented and accomplished musician—in the traditional sense—at the festival. His album Hyperion can be accessed on YouTube and I guarantee you it will prove an unexpected and wondrous delight. Back at the Castle, Electro-industrial duo A Split Second set the crowd to frenzied rocking with guitar-driven, rapidly cadenced music and accompanying vocals. The show of course was stolen by Belgian group Suicide Commando whose harsh themes, nasty lyrics (“Die, die, die!”) and techno-industrial sound have earned it a prestigious place in every festival of this kind of music. They were followed by Neuoberschlesien, a conventional heavy metal group, clearly influenced by Rammstein both in sound and stage production, who lit up the scene with bursts of flames as part of the stage act, and who worked in some patriotic Silesian anthems between head-banger tracks. Neuoberschlesian in German means New Upper Silesian, referring to the culturally distinct, historically Prussian province of Poland with its own dialect that to this day harbors ambitions to be autonomous. The night ended with My Dying Bride, a doom metal band with an ominous bass intro, slow paced and plaintive synthetic strings and choir samples issuing mournful chants. I found their music to be free of all logic, with sudden and irrational shifts of tempo and musical notes played in a sequence lacking any recognizable melody. This venerable upstairs bar and downstairs dance floor is situated a short walk from the castle and becomes crowded—very crowded—when the shows at the castle and church let out. Castle Party wristbands are required to gain entrance. Smoking—an atavistic vice, still nearly universal in Poland—is only allowed in a small, outdoor pen. While it might have been possible to find your way to the bar, and it might have been possible to gyrate rhythmically in place in the densely packed dance floor downstairs, it proved too crowded for us to take part in either drinking or dancing. All you could do, really, was smoke. Up at the Castle, Polish grunge rockers K-Essence performed such highly perfected Seattle-style nostalgic rock from their album We Prefer the Night, that I was surprised that they weren’t wearing flannel. It was done so incredibly well that it happily transported the small audience (I counted 60 spectators) to the golden age of ’90s alternative rock. But it wasn’t the kind of music that most at the festival had come to hear, so we headed down to the church where Black Tower from Poland was doing a set that would have made Wumpscut proud, and it had the effect of charging the crowd up to a near frenzy of industrial ecstasy. Next, Frank Croona from Sweden was definitely no crooner, but rather a raspy-voiced aggro-industrialist, delivering his harsh vocals to dance-trance rhythms. The church proved to be the place to be that night, as H. Exe from Poland merged the growling vocal style of black metal with techno-industrial accompaniment, and the audience, set in motion by Black Tower, continued to pulsate rhythmically and excitedly. Finally German electro-industrial duo, In Strict Confidence, closed out the church show with deep, hoarse vocals layered over a melodious and thunderous cadence while video-projected flames licked the stage and the backdrop. So well received was H. Exe, that the audience demanded them back for several encores after their regular set had concluded. So it was back to the castle for headliners and concluding act, Tiamat, but before they came on, we had to stare in wonder at the less-than-entertaining French outfit Vive La Fete performing the annoyingly kitschy “Popcorn” theme that dates back to the early days—1969—of the Moog synthesizer. The show was not redeemed by a lanky blond cavorting in black tights, whose goofy grimacing and posturing served only to highlight their curiously boring music. The question inevitably arises: What is Vive La Fete doing at Castle Party of dark independent music? And what, especially, were they doing on the playbill on closing night, just before the headliners? Finally headliners Tiamat, officially from Sweden, took the stage amidst much anticipation. Tiamat takes its unusual name from the Babylonian goddess of the chaos of primordial creation. Lead vocalist Johan Edlund came out wearing an army uniform complete with a Polish army World War II helmet. One could sense that there were going to be predictable, direct and indirect, denunciations of war as is the stereotypical custom at alternative music events these days. Why do these performers think they are bearers political enlightenment? Do they really think that their audiences need to be preached at regarding the how objectionable is the institution of war? Or do they think that they are the special messengers of this wisdom? Well in any event, after announcing somewhat pretentiously that they were “from Sweden, from Spain, from Canada, the U.S., whatever,” Edlung scornfully discarded, first, the helmet, then parts of the uniform into the audience to let us know what may have news 50 or 100 years ago, namely that rock musicians don’t like war. I would have counseled him to have more respect for a symbol of Poland’s valiant resistance in World War II. The good thing was that as he removed articles of army uniform he at least picked up a guitar and played along. Song after song seemed to drag at a funeral pace as if each needed time to sink in. The music did pick up energy toward the end of the set, and overall the performance was good. Let’s face it. Theirs is good material. But we were of the opinion that one’s appreciation of Tiamat would have been better served by going to Spotify and listening to any one of their albums from the past. Thus ended a joyful and unique four-day experience for those from the gothic, punk and industrial music world. In all respects Castle Party 2017 met and exceeded every expectation of fun, great entertainment, feasting, freedom and, even, enlightenment. What is there that is special about Castle Party? Virtually everything! Set in a small Eastern European town imbued with history and with Slavic hospitality, it brings together a virtual cornucopia of post-punk music from traditional gothic, punk and industrial to techno, experimental, acoustic and electronic. Some might consider Castle Party to be somewhat indiscriminate, but who can say what the boundaries are between styles and tastes? Castle Party is more about breaking down barriers than establishing them. In the same sense, it brings together a rich ethnic mix of performers and attendees from both East and West, in an environment that promotes transcontinental friendship and acceptance. Political, nationalistic and historical ideologies dissolve, or rather evaporate in the thin, clean air of the Carpathian Mountains. Music fans and lovers of dark aesthetic and philosophical themes meet in an environment of quintessential camaraderie that scorns the petty issues and jealousies of the mainstream societies from which they have dropped out—some for a few days, others for life. United by the bonds of post-punk culture and the near universal fluency in English, Castle Party creates an environment that is both universal and intimate. Dressing up and showing off in punk, gothic, or steampunk outfits, head banging the night away, dancing in friendly mosh pits, the participants in Castle Party defy the outside world’s manufactured and irredeemable preoccupations with status, religion and ethnicity while celebrating their shared nonconforming attitudes. The Paul Booth and Last Rites Galleries in Manhattan held simultaneous exhibitions featuring monochromatic, i.e. grayscale or black & white works. On the ground level, specifically the Paul Booth Gallery, the exhibition was titled “Tire Fire” and consisted of charcoal and graphite drawings by Jesse Draxler. These could be characterized by extreme reductionism, paring the human face down to barest essentials—eyes, nose and mouth, with sketchy, whimsical and hastily applied details like lips and hair. Some of these achieved a stunning creepiness, evoking emotions of alarm, despair or hysteria. Draxler also turned one wall into a “tower” of neatly arranged but loosely applied black sheets representing his deleted, abandoned works, blackened over to hide his failed, discarded efforts. Upstairs in the Last Rites Gallery Nicomi Nix Turner’s “The Dying Thought.” While also black & white, presented elaborate, sharply defined, and detailed images using a composite of media including graphite, oil, wax, and resin on paper. Human nudes, animal subjects and biological subjects were juxtaposed, inter-acted and merged in unconventional poses and predicaments. While in southwestern Poland for Castle Party we took a two-hour car journey to this chapel in Czermna near the Czech border where a famous chapel houses an ossuary and a catacomb containing the skeletal remains of around 24,000 deceased, of which about 3,000 are on actual display forming the walls and ceiling of the chapel itself. Between 1776 and 1804, it was furnished by a local priest, influenced by the famous catacombs of Rome, with the skulls and leg bones of victims of the Thirty Years War, various plagues and famines. Fr. Tomaszek exhumed and cleaned these skeletal parts from mass graves and arranged them in this once-active church in order to restore their dignity and significance, and put them on display in the tradition of a memento mori, i.e. a reminder of mortality. He placed skulls with curious features such as bullet holes, the effects of syphilis and giantism right on the altar for viewing. Eventually, his skull was placed there as well. Recently added celebrity skulls are those of persecuted priests martyred by the Nazis during WWII and, later, by the Communist agents of the Soviet Union. There is a small memorial to the 96 members of the Polish contingent whose plane crashed under suspicious circumstances in Smolensk in 2010. It will be recalled that they were en route to meet with Mr. Putin to commemorate the 1940 mass execution of the 22,000 Polish officer corps, perpetrated by the Soviet NKVD at the Katyn Forest. Mr. Putin was thereby conveniently saved from the embarrassment that such a meeting might have caused. There are numerous ossuaries around the world where for various cultural and/or religious reasons, the bones of the dead are put on display. Most are maintained below street level, in basements or tunnels as in Rome or Paris, and these are termed catacombs. Kaplica Czaszek is among those few that house the remains in structures above ground. It is now more a tourist attraction than an active church, but midnight mass is celebrated once a year on August 14, the Feast of the Assumption of the Virgin Mary. Brief tours are chaperoned by nuns and scheduled on a regular, basis through the day. Photography is prohibited. Manhattan Beat: Blondie, The Melvins, Poptone and More! I just saw this now. I was actually the Depeche Mode DJ on Sat July 29 2017 for the Depeche Mode party and always the main resident DJ who spins the Depeche Mode cruise. DJ Ash spins with me, I was the one who suggested hiring him. I’ve been the main Dj for this cruise since 2009. As a female I often find myself forgotten about and dismissed by photographers and the like. Again here, I am forgotten and dismissed. I hope you can find yourself again at Ward 6 Feb. 17 when I spin Depeche Mode again, and in July 2018 when I do the Depeche Mode cruise again. Glad you had fun. Hello! Thanks for reaching out! We’ll give our writer the heads up in case they pass through there! Also, feel free to reach out to our editor (via contact page) about coverage possibilities! 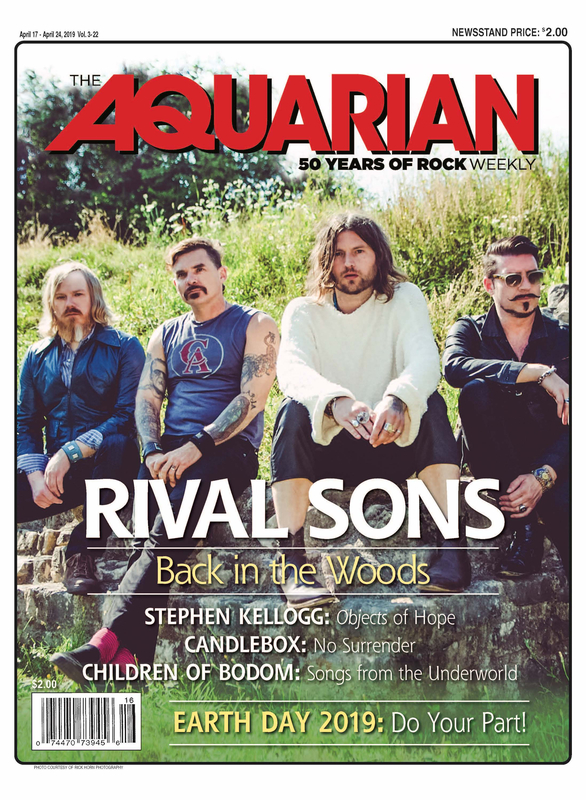 By the way, my friend Glyn Emmerson has been writing for The Aquarian for many years.